Trying something a little different here! A rather popular coffee chain (Starbucks) offers a "protein snack box" for sale. 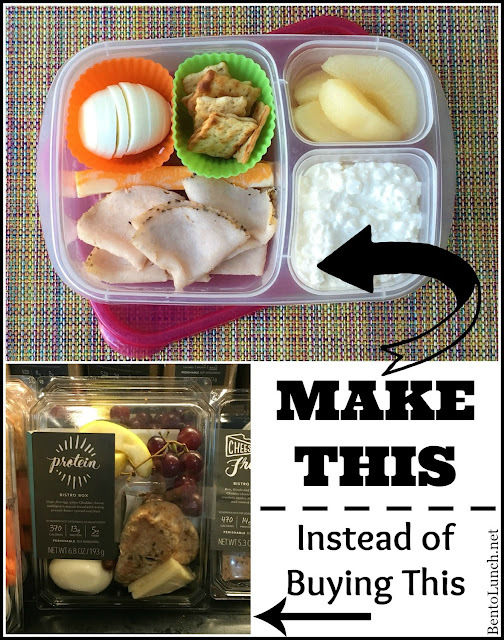 It comes with a cheddar cheese, a boiled egg, multigrain bread, peanut butter honey spread, and fruit (usually apple slices and grapes). It contains about 370 calories, 13 grams of protein, and 19 grams of fat, and retails for approximately $5. Now, at least at our house, a $5 price tag on even a semi-frequent basis is just not happening. We also aren't sold that 13 grams of protein makes a meal a protein box either. So we came up with plan B, can we make our own? 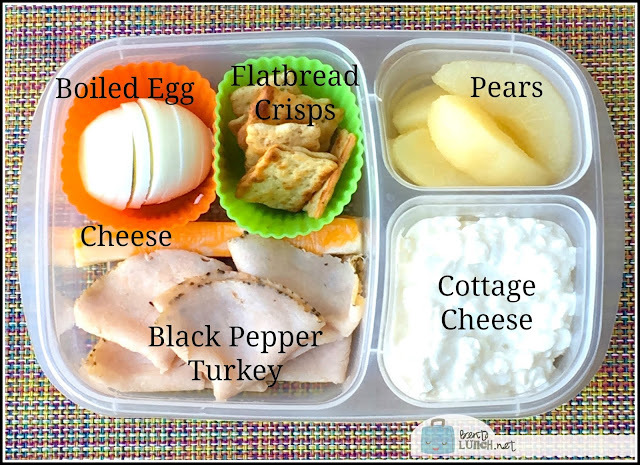 We played around with food and ratios (and what was in the fridge on that given day) and came up with our own version of a protein box, packed in one of our EasyLunchboxes to make it easy to grab and go. What's in our protein box? Hate cottage cheese? My husband does too, even though I love it. You can also swap that for Greek yogurt (I chose Chobani since that's what we had handy) at 100 calories, with 10 grams of protein and 1.5 grams of fat. $1.70 total cost of the meal box, so that's nearly three for the price of one at the coffee shop! And, since I use reusable containers, there's zero packaging cost involved. We highly recommend EasyLunchboxes for this since they held all our food with room to spare. Since they come in a set of four, we can prepack several at a time, and just add the crisps at the last minute. Want to pin this post for future reference? Just use the graphic below to save it for later. I love how you were able to amp up the protein and cut the cost by so much. With your reusable packaging, you are also helping the planet! Nice work! Thanks! I was amazed when I actually broke down all the numbers! This is great! I need all the ideas I can get with my oldest starting kindergarten- and needs 2 snacks plus lunch. Thanks! Thanks! 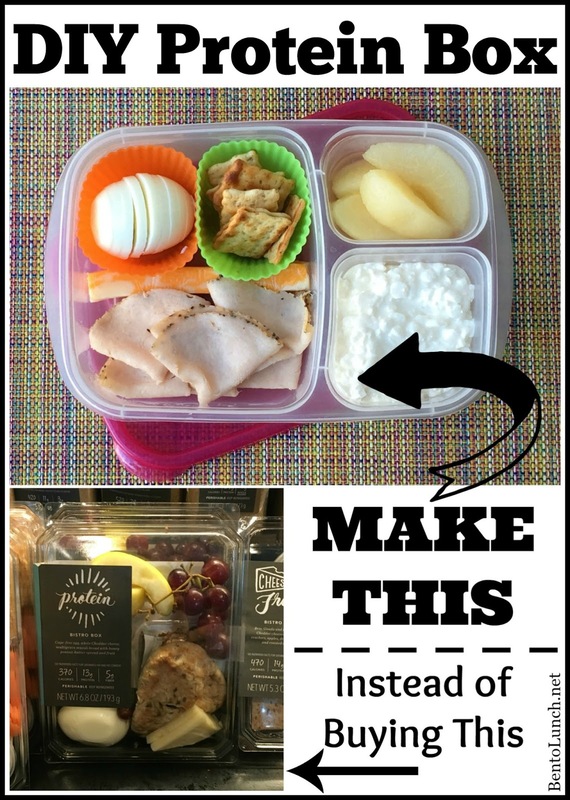 My best tip is probably prepacking, especially laying out snacks or fruits or yogurts for the week!